In today's post I'm going to show you three more colors from the "Breaking Bad" collection by Cadillacquer. The collection consists of 12 gorgeous and unique colors, three of them I have previously shared with you in this post. Be sure to check other colors from this great collection at the Cadillacquer site. In this post I will be showing you the following colors (L-R): Mr. White, Better Call Saul! & Yeah Science! Mr. White is a black base with scattered holographic effect and micro flakes that change their color from pink to blue. I think this polish has the most unique color and effect, this is definitely my favorite color from this trio, and the most interesting polish I've encountered lately. Trust me when I say there's much more to it than you can see in these photos. This polish was gorgeous in person! The formula was great and easy to apply. Since it's a dark base I only needed two coats to get a perfect coverage. I applied a top coat for a glossy finish, and this also made the effect more noticeable. I love how this polish has almost two different looks - In shade you will notice the pink-blue micro-flakes, and the scattered holo comes to life in the sun. Better Call Saul! is a blue base with turquoise shimmer and scattered holographic effect. 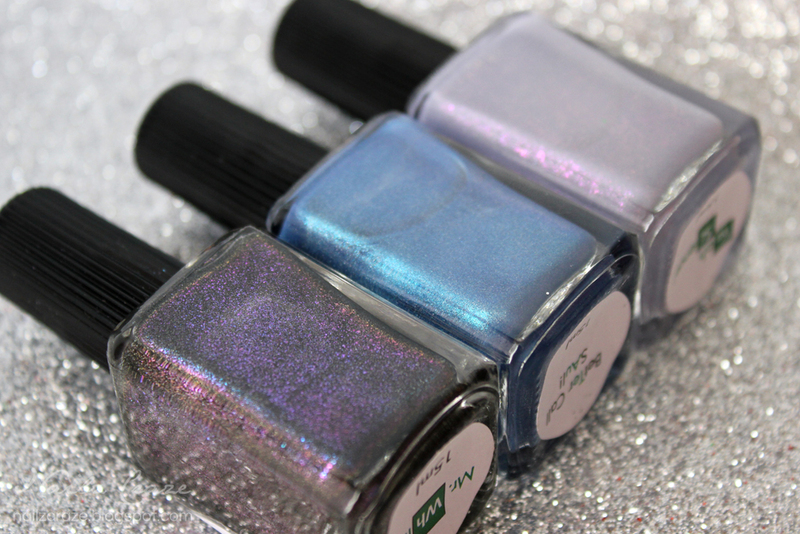 The shimmer in this color gives it a pearly look in some angles, and the holo effect is relatively subtle. The formula was nice and easy to apply, and although you can notice the brush strokes in some photos, this wasn't a streaky formula I believe this was caused by the shimmery/pearly effect on this polish. For these photos I also applied top coat. Yeah Science! is a light lavender shade with pink micro-flakes and subtle scattered holo effect. The pink micro-flakes in this polish are really beautiful but they were hard to capture in the photos. The scattered holo effect is barely noticeable as well since it was too weak even in direct sun light, but it gives the polish a delicate sparkly look. The formula of this polish was a bit more sheer so I used two thick coats, or you can just go for three thin coats since it dries relatively fast. For the photos I applied top coat. The color is very pretty but I usually avoid these colors because I don't think they look nice on my skin tone. Cadillacquer "Breaking Bad" collection can be purchased at cadillacquer.com along with other beautiful collections, worldwide shipping available. Cadillacquer is 3 free and cruelty free, handmade nail polish from Switzerland. Be sure to follow Cadillacquer on Facebook and Instagram for the latest updates and more great nail polish! Tags: Better Call Saul!, Breaking Bad, Cadillacquer, Mr. White, Yeah Science! awesome i like those color !!! This last one is so cute! Mr White is awesome (I'm talking about the polish lol). I love your macro pictures with the bottle and nail side by side! We can see the shimmer so well! I'm also watching Breaking Bad right now, and I LOVE it! O segundo é um escândalo de lindo. Este trio está maravilhoso, mas o Mr. White sem dúvida é o mais lindo! I just LOVE how Yeah, Science! looks on you ♥ stunning swatches, as always!